Lets see your wedding rings sets ladies! All different shapes and styles are welcome! Please inlcude your ring size and carat size. Most of my rings I wear solo without bands (out of preference), but I do have this alternate H&A moissanite set I wear. The ring is just a bit too loose alone on my left finger (it is normally a RHR) but the band tightens it up. Ring size 5 (the three stone is sized to a 5.5 + sizing beads, band is a 5 3mm comfort fit). Centre 7.5mm (1.5ct equivalent), sides are 6mm each (.75 equivalent). Ring is 18k yellow gold, band is 14k yellow gold. Center stone is around 1.25 I believe? Here’s my set! I’m not completely sold on the matching band so we might get some other diamond band for me to wear (I don’t mind the gap). My pear center is approximately 1 ct, ring size 5.5, setting has an additional 1 1/3 ct tw, the matching chevron wedding band is another 3/8 ct tw. Centre stone of Engagement Ring is 0.9, tcw of Engagement Ring is 0.99 I think. Size 5 finger but rings are 5.25 for swelling etc . My current wedding set which I got as a early anniversary present 🎁 from my husband for our 10 yr anniversary is 1.70 TCW and 1.03 elongated cushion brilliant center . Paired with a plain platinum band . I’m a switch-it-up kinda gal, so I have a few different sets I love to wear. There are two I wear most often, though. I’m a size 7. And this is my “anniversary set”. Anniversary ring was a gift for our 15th, and Darling Husband picked the band to go with it as a Christmas gift that year. This will be my set (only two months till I can wear them together!) They’re both Swiss blue topaz. 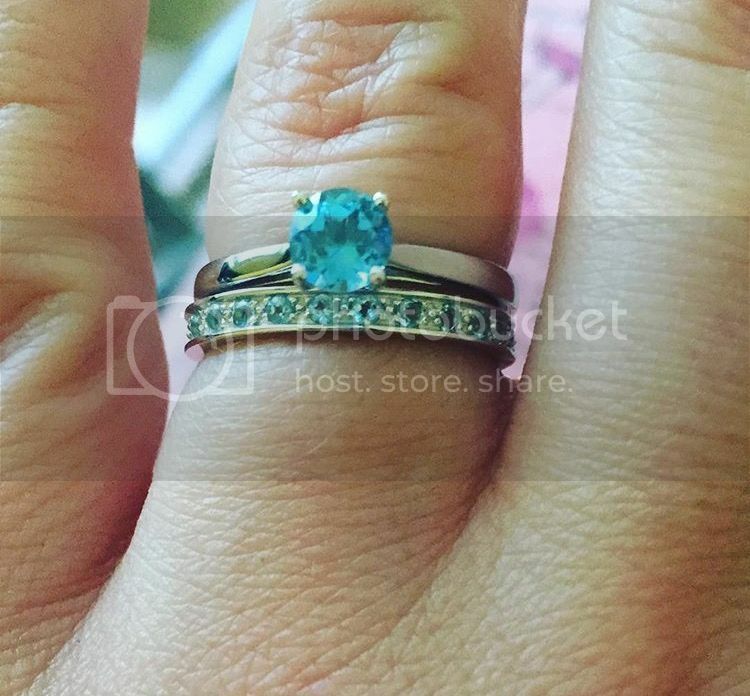 My e-ring topaz is 0.50ct equivalent. No idea about wedding band. Size 5 finger. liaeona : I’m normally not a fan of two matching, curved bands but I LOVE yours. So pretty! i did a mix and match kinda thing so my band wouldn’t just get lost under my ering. i cannot wait to get to wear it for real! 8 days!! 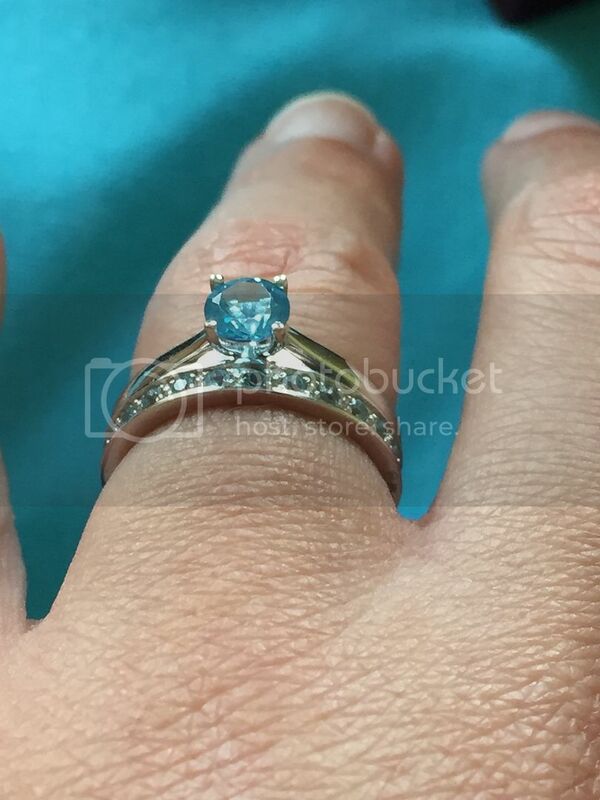 however, the more time i spend on bee…the more i loveeeee classic solitares with eternity bands. Here’s my set on my size 7 finger. mrsblanco827 : Lovely set, I love the colour of your sapphire.